The following is a repost. The original thread was locked because I said something that upset someone. That something has been removed from this post. I do not think that just because someone was upset, the subject of this post should have been swept under the rug. Thank you. In response to Dev Q&A 6.15, to quote the esteemed lawyer, Vinny Gambini: "Everything that man just said is bull****." Seriously Wargaming, it feels like you don't even play half the lines you create, and that you don't care either. Even if the torpedoes were balanced in their current state, even if it weren't the case that the community agrees that american and german destroyers are better torpedo boats than the IJN, why do the IJN destroyers have to trade worse guns for (supposedly) on par torpedoes? If the torpedoes are equal to their counterparts, why aren't the guns? Why is it that in almost every situation, if torpedo power were equal, an american or German destroyer would be better than a Japanese one? 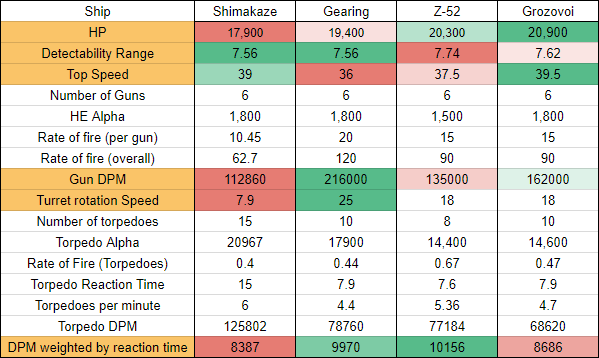 This chart shows exactly what I've been feeling, that the effectiveness of the shimakaze is questionable at best. So what does this graph look like with the 12km torpedoes instead of the 20s, on Shimakaze? it's pretty stupid that it's the only tier 10 surface combat ship with a crap stock grind, but let's assume that crap stock grind is finished. Don't use the 20km torps, they are relics of the past and are total junk. Here is some rules that WGing should apply to all DD's. Cannot have turret traverse speed slower then fastest heavy cruiser. Cannot have main battery reload speed slower then fastest 152mm light cruiser. That would fix like 90% of IJN gun problems. Here is a way to make IJN torps more accessible to lower skilled players. 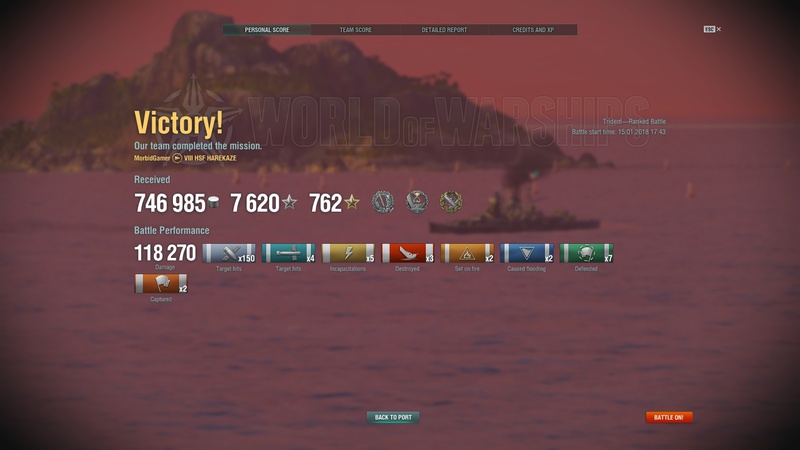 Cut torp damage by 50%. So the main form of damage would be flooding. Yeah, i’m getting kind of irritated that these detailed posts keep getting locked because somebody like Flamu throws a tantrum on it. Back in the day, they just “moderate” the offending posts. So the main form of damage is a thing that players repair instantly and you end the match with less than 5k of that damage type basically every time you even get any. Got it. Not a massive nerf at all. Let's also keep in mind that it gets 50% more torpedoes in the water than the Gearing, and twice the torpedoes in the water of a Z-52. Although I agree that there should be a slight buff to their torpedo detection range, we also have to keep in mind that putting an extra spread into the same area makes them at least a slight bit harder to comb. 15 torpedoes into a tight area is nothing to sneeze at. In open water, yes they're easier to dodge because you can see them from orbit, but in any confined space (or at close range) 15 is a lot. Hey, at least with my Kamikaze R, I stand a good chance of flooding out an enemy ship, cause I only need to worry about a 30 second reload. Nearly twice the effectiveness of the 20KM torpedoes, HOWEVER, playing at the ranges of 12KM or less puts more emphasis on the gun power and health of the destroyer, as the likelihood of entering a knife fight increases exponentially as your range decreases. I wish I had a way to quantify this on the chart, but there is no way I could display this without someone crying that I'm skewing results. Remember, the gearing doesn't have to make this choice, their 16.5 km torpedoes are stealthier than the 12 km torpedoes, with most of the range of the 20 Km torpedoes AND it's primarily a gunboat. Let's keep in mind that I'm factoring that into my calculations already. So who would instantly repair it? Other then DD's. With a concealment buff you'll land more torps. With a reload buff your going to launch more torps in a shorter time. So I fail to see a nerf. Half the lines of that movie were gold. the other half, silver. Nearly everyone instantly repairs flooding. Many ships save repairs for possible flooding even when they have 3 fires going. I say this as someone who's played torpedo boat destroyers as torpedo boats for 2 years. Flooding rarely sticks. Unless Shimakaze has Kamikaze R's reload (and torpedo damage, let's be fair here), the fact that torpedoes miss so often is going to result in a massive nerf to damage if you rely on flooding because torpedo reload + travel time alone are still going to be longer than DCP's cooldown. And then factor in the inevitable times you whiff entirely. 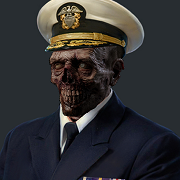 "the job of the destroyer is to cause flooding so the cruisers can farm damage with fires after the battleship burns damecon"
"The job of torpedoes is to cause the battleship to turn so your battleships can citadel it." I don't see (nor do I know how you would even begin to do so) any reference to how easy or hard it is to avoid 15 torpedoes within a given path than to dodge 10 or 8. What's the average hit rate of torpedoes on the NA server for each of those lines? It would also depend greatly if those torps are fired in open water (wall of torps) vs a straight between two islands (where they would be condensed into a smaller area). Warships Today is down (again), but just from my own experience Shimakaze in the games I've played in seem to do just fine. Yes, they're aren't meant to be gun boats, which is why they get 50% more torpedoes and longer range. "pop smoke and spot for the battleships!" The second ANY ship starts flooding, they are going to hit their [R] key and stop the flood. The only exception is if you just happen to catch someone on its cooldown (not likely). Well, then your not launching torps at the right ships. You have to play like a CV... Watch for burning ships attack them if you can. If you have torp reload booster. Then there is no reason not to have a perm flood. If you land 2 torps instead of 1 you already made up for the 50% damage reduction. So I don't see how it's a nerf. The original plan was to use torpedo hitrate as a multiplier instead of reaction time, as that would come up with more concrete effectiveness numbers, but as you said, Warships today is down. sure, they get 50% more torpedoes, but at the cost of a longer rearm. While other people have issues. That is if you can set fires on said ship and they extinguish it, you can catch them on their cooldown. That is if they aren't doing any evasive maneuvers and you hit the torpedoes. Even though skilled players will know how to conserve their repair party so catching a skilled player off guard, not going to happen. Against a not-so skilled player, it could work. Any time I hear somebody describe themselves as an X main, I get concerned. A game like Warships is going to always have a dynamic metagame and balance. If you decide that your entire satisfaction from the game boils down to how one ship, or even one category of ships plays, then you're always going to be frustrated. Are the Japanese destroyers the strongest in the game? No, not really. Is the Shimakaze particularly gimped by the current meta as compared to some other T10 DDs? Sure. Is the sky falling? I'm not so sure. That table is very cherry picky. There are a lot of things there that either don't reflect any sort of realistic configuration (e.g. : Concealment Expert and Concealment System). 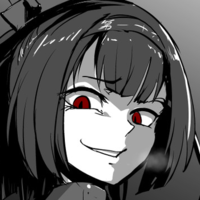 Furthermore gun DPM in particular is entirely hypothetical, the Gearing has an exceptional rate of fire, but in anything other than farming damage on a battleship or a very short range gunfight it isn't going to be hitting a whole lot of the time. 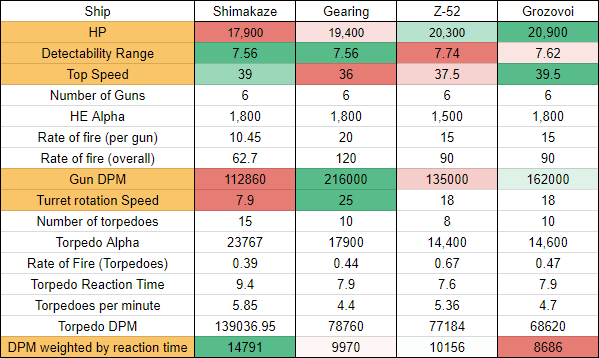 The Shimakaze isn't a particularly comfortable destroyer unless you have a captain with 15-17 points and the 12km torpedoes, but it still hits like a truck and anything that is going to modify its play style needs to take into account the reasons that the Shima was nerfed in the first place. There isn't an easy answer, but anything that pushes in the direction of having 15 Shimakaze torpedoes being harder to dodge needs to take into account that being hit by more than a few of them essentially means most ships at T10 will be deleted in a single salvo. No matter what you say, using a stock configuration to compare against a final configuration is silly and it misrepresents the situation. It is not a fair representation of how ships are a balanced. No other ship is balanced around it's stock configuration. I have no idea what "DPM weighted by reaction time" is supposed to represent. If you're going to "show your math" then show the formula, otherwise you're just showing answers and nobody can understand or criticize your methodology. Generally speaking alpha damage is far more important than DPM in most online PvP games. I get your point, but without factoring this in, it's hard to draw a clear conclusion or recommend a solution that doesn't create further balance issues. Destroyers shouldn't be measured primarily by their damage per minute. 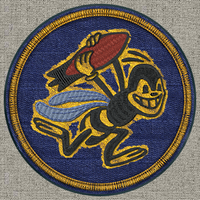 They're utility ships that are most effective when leading objective play and acting as scouts or denying zones. I tend to agree that the Shimakaze isn't the strongest ship in these areas, but this is a very different set of considerations. Just knowing a Shimakaze is in an area and remains unspotted can dramatically influence the flow of the game if the player is competent. See: point 3. Are there balance issues? Yes. But I have yet to see a sensible suggestion for this particular ship that doesn't ultimately boil down to "I should be able to torp people easily with most of the torpedoes in my salvo at near my maximum range". We've been there before with this particular boat and there are good reasons that this particular ship's torpedoes should be significantly easier to detect and dodge than any of its direct competitors, the only question is a matter of degree. A CV can see the whole map, zoom in to see which ships are burning, then get planes there within seconds... A DD would take minutes to reach such a position (and the target's cooldown would be over by then). Getting flooding damage is tough. Most of my torpedo hits cause flooding, most games I end up with ZERO flood damage (the enemy hits repair the second they see the flood). By the time I reload, so has their repair button. If I start a fire first, I've given away the element of surprise and now they know to expect torps, and they'll dodge before my torps get there.